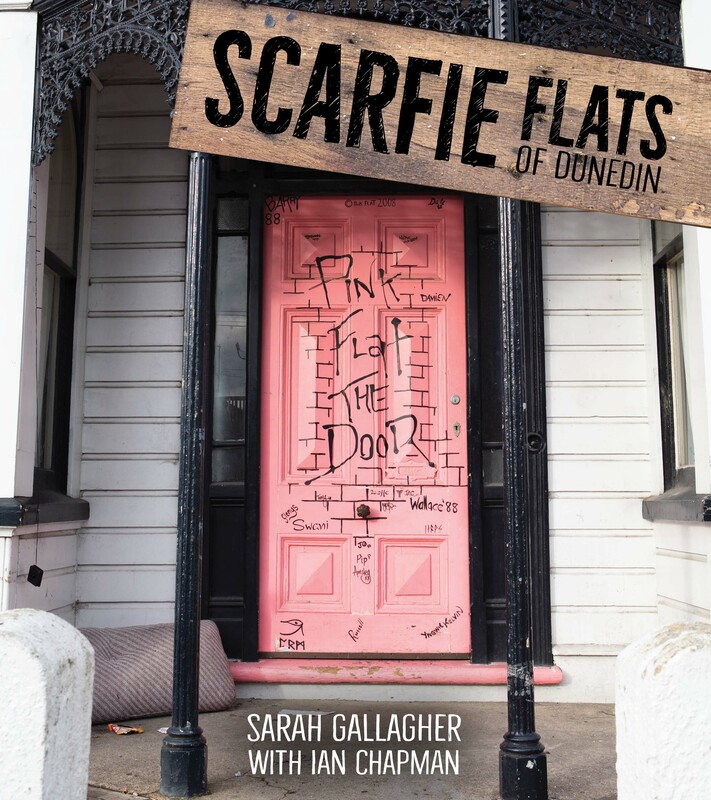 In April 2018 the stars aligned and Sarah Gallagher, of the Dunedin Flat Names Project, and Dr Ian Chapman, Senior Lecturer in Performing Arts at the University of Otago, teamed up to create Scarfie Flats of Dunedin – a highly colourful and pictorial work featuring a fine, witty, sometimes edgy, selection of Dunedin’s well known and less well known named flats. Featuring a selection of back stories of flats, photos and associated ephemera, as well as chapters by subject matter experts, readers will appreciate the changing scene of student culture and society in Dunedin from the 1930s to the present. Sarah is grateful to be the recipient of a New Zealand History Research Trust Award which has been used to help fund the research of this book. Scarfie Flats of Dunedin, published by Imagination Press, is available through Paper Plus, Dunedin’s famous University Bookshop, other independent bookshops, Fishpond and Mighty Ape. Contact Sarah directly to arrange purchase of a signed copy. Check out the latest media stories about the book and view the locations of these tales on The Great Map of NZ Stories. Students continue to name their flats and there are plenty of stories still to be recorded! You can contribute content by sharing your story, provide missing details, or send an email to flatnames@gmail.com. Just wondering if you’ve ever had the pleasure of looking at Adventure Time at 652 castle street? Was there in 2013 and there’s been some good things to come out of that since then! Tyler, send me details of these good things, and I’d love to know more about your relationship with the name. It’s one of my favourite signs (am also a fan of the cartoon). I hope you’ve got 589 Castle Street. Or Eltsac Castle as we new it. It looks like it’s still there. I do inf=deed, it’s been called The Jungle over the last few years but I remember it as Eltsac Castle when I was a student in the 1990s and for some years after. Did you name it? The Haunted House 48 Howe Street ? Yes, I have photos of the sign but no stories, I’d love to know the back story to its name. 118 Queen Street was known as ‘The Colony’ with printed t shirts and other screen printed paraphenalia when we were there 1969-1970 as med students. It was then owned by the Director of Religious Broadcasting for the NZBC – we negotiated to paint and carpet and do other repairs after visiting him in Wellington. Do you have more or need more on this flat? We have a few old photos if of any use to this intriguing piece of contemporary history. Hi Robert, thanks for getting in touch. I have no information at all on this flat so am very glad to hear from you. I’m interested to know about the origin and meaning of the name, and what the sign looked like if there was one. I’d be very grateful for any scans you can provide, especially if there is a flat sign involved. Feel free to send this through to flatnames@gmail.com. (they do need to be high resolution to make it into the book if possible). Pink Flat the Door, on Clyde Street!! Definitely gong to be in the book! Did You live there Peter? Do you have an entry for 18 London Street, which in the 60’s and early 70’s was called “Skid Row”? In 2015 it was known as “The Orifice”. I do thanks but am always interested in any stories related to named flats, do you have any? Thanks to Sam contacting me about his named flat, The Brew House, and then me discovering his blog and awesome design skills, we had the chance to work together which is very cool, and really, very Dunedin. Did you get the Jam Factory flat, next door to the Factory itself. in Filleul St. I lived there with physios in 1957? There was alson a flat in Transport Place. Anna – so good to hear from you! The Jam Factory is a story I’m keen to hear more about. Do you recall the address and whether or not it had a sign? I’ve not heard of the flat on Transport Place, where was that?